Many people avoid travelling to Dubai between May and September because it can easily get between 40 and 50 degrees Celsius in the daytime during the summer months. The advantage of visiting Dubai at that time of the year is that you can get a hotel room for 60 to 70 percent of the price which you would pay in October. Therefor and because I wanted to interrupt my flight to Beijing I thought that I should give it a try and see how I can stand the heat. As I have been to Dubai three times before and thereby especially explored the modern part of Dubai, I was inquisitive to learn more about the culture and the religion of the United Arab Emirates. The tourist office of Dubai in Germany suggested a guided tour through the Jumeirah Mosque which I had already planned to do in October 2013. Back then I was unfortunately there on a Friday, the only weekday the Mosque is closed for the public. Therefor I had to wait until visiting Dubai the next time which was in mid-August 2014. After landing in Dubai the night before, the stewardess announced that the local time was 7.15 P.M. and the outside temperature 39 degrees. When I got off the taxi at the Jumeirah Mosque in the morning of the next day, the sun was burning on my skin so I headed into the shadow as quickly as possible. We were about 20 people in the group. Before entering the Mosque we had to take off our shoes. For those who were not dressed modestly, the Sheikh Mohammed bin Rashid Centre for Cultural Understanding which organises the guided tours provides loose clothing that covers the body. The guided tour was not a guided tour in the classical sense as we were not guided through the Mosque. 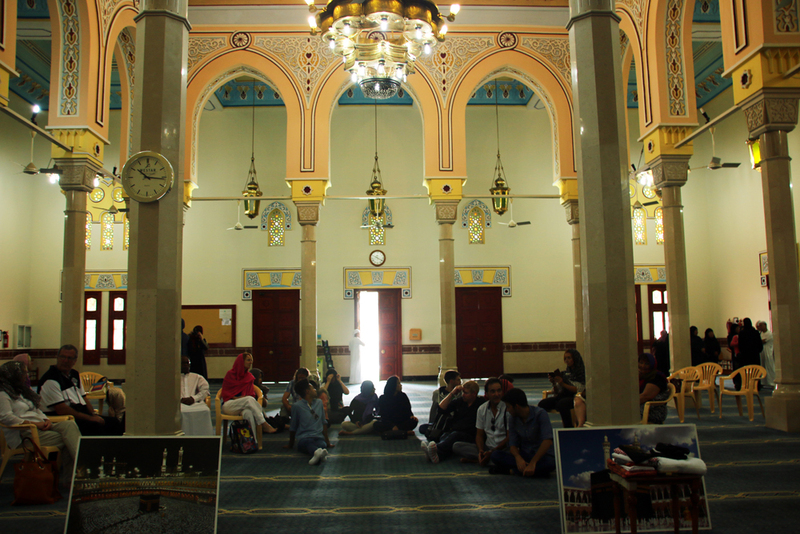 After entering the Mosque we were asked to sit down in the front of the building. Our guide was an American named Debbie who is originally from Chicago. She was born and raised in a strictly catholic household, went to a catholic school and studied computer science at a catholic college. After her graduation she worked for a company in the United States together with a few muslim colleagues who aroused her interest for the Islam. At her request they gave her the Koran in English language which at that time was hard to get in a different language than Arabic. She read the Koran from the first till the last page within 14 days, like she has read the bible from the first till the last page in her childhood before. Afterwards she converted into Islam. This was more than 20 years ago. A few years later she met her husband who is from the Gulf States. They have seven kids, two of whom still go to school. About ten years ago they moved from the United States to Dubai. She works full-time as a computer specialist and volunteers at the Sheikh Mohammed bin Rashid Centre for Cultural Understanding in her free time. 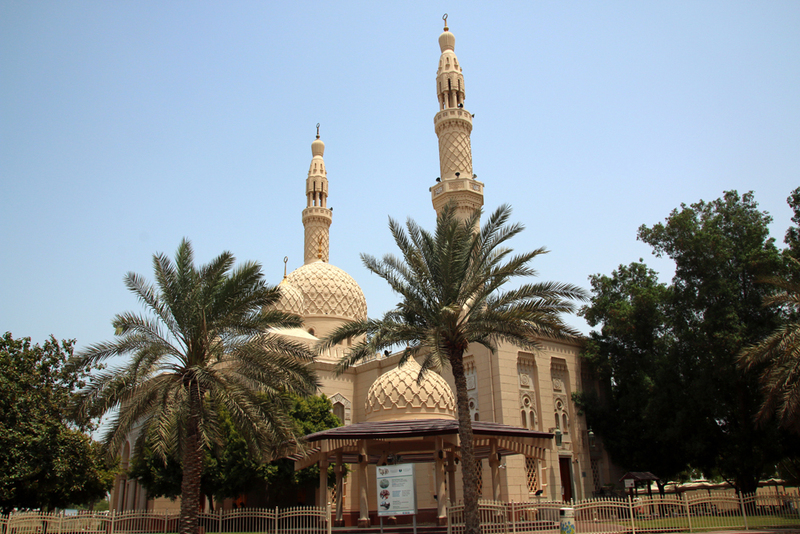 Debbie reported about the Jumeirah Mosque which was built between 1975 and 1978 at the instigation of the ruling family Maktoum for the inhabitants of the Jumeirah district. 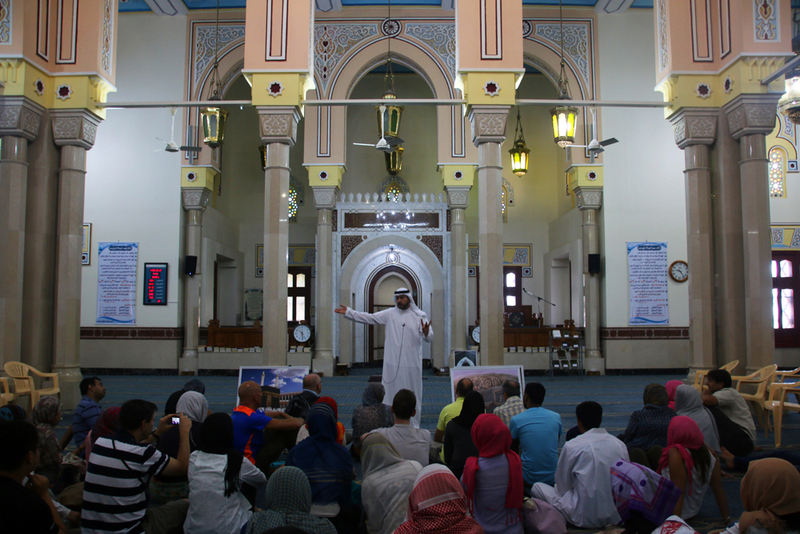 The Mosque is the focal point of the “Open doors. 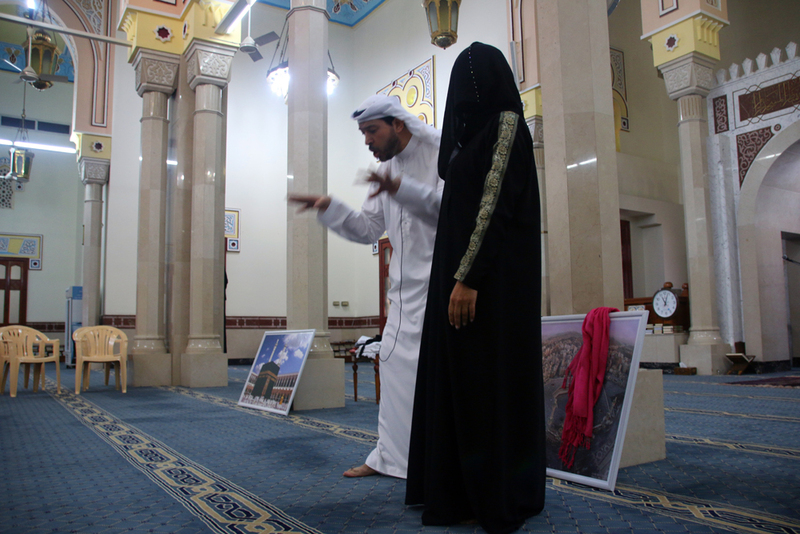 Open Minds.” programme of the Sheikh Mohammed Centre for Cultural Understanding which is designed to inform both, Muslim and non-Muslim guests, about the Emirati culture and religion. 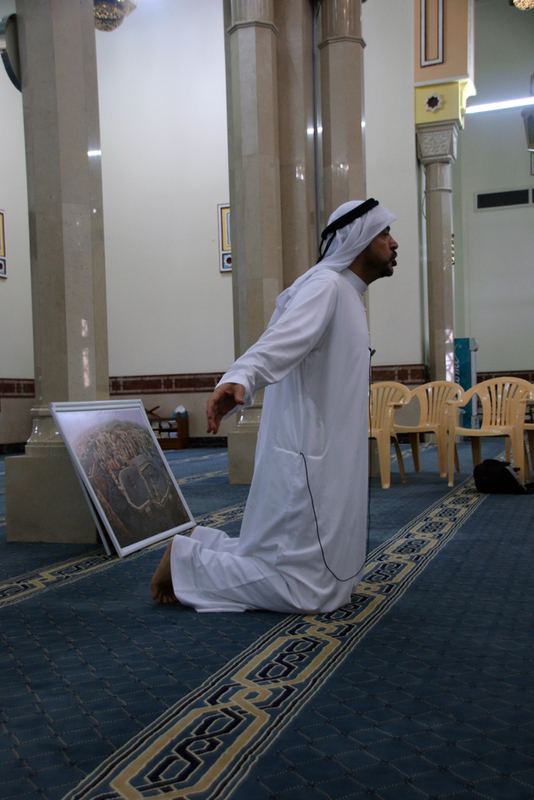 It is also the only Mosque in Dubai which is accessible for non-Muslim visitors, but only as a part of a guided tour. 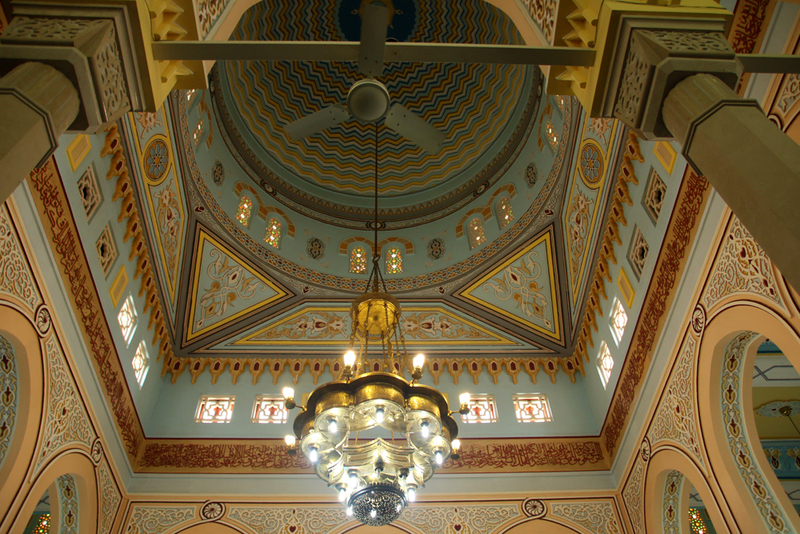 Unlike in other Mosques photography is allowed. 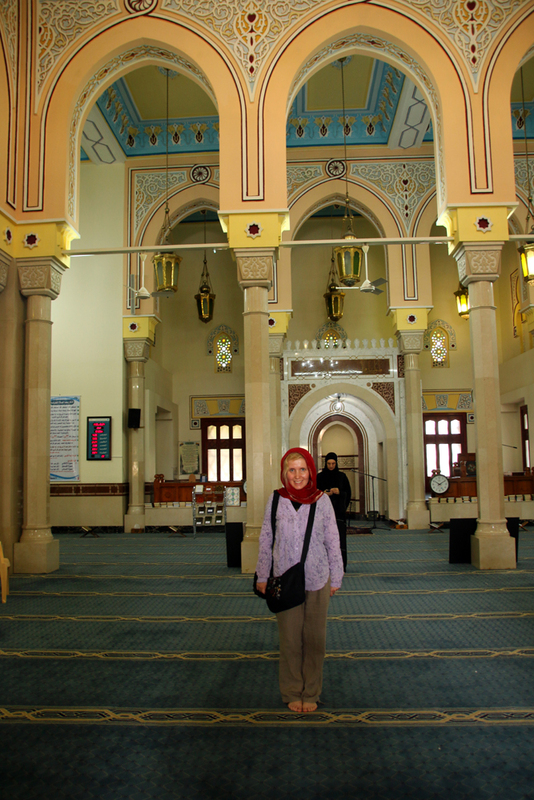 Debbie gave us a great insight into the Islamic religion first, then she showed us a photo from the Hajj in Mecca and refered about this important pilgrimage every Muslim should take once in a lifetime. She talked a lot about women in Islam, about female rights and equality and why Muslim women originally started to cover up which was to protect themselves from sun, sand, dust and dirt. I was deeply impressed by this strong, emancipated and self-confident lady. After the tour finished we talked to each other for a while, together with two chinese women, mother and daugther, from Shanghai. The daughter had recently converted into Islam as well. I liked the tour so much that I joined it again only six and a half weeks later. It was during my next stopover in Dubai in early October 2014 when I was on my way to Beijing to travel along the Silk Road of China. Originally I had intended to do a Heritage tour through the historical district Al Bastakiya or to attend a Cultural Meal. But I hadn’t realized that I would be in Dubai during Eid al Adha, the second of two religious holidays celebrated by Muslims all over the world. Therefor most activities including the Heritage tour and the Cultural Meals didn’t take place. Since I had planned to join the tour through the Jumeirah Mosque again anyway, I thought that it was a great alternative. This time we were a bigger group of about 30 to 40 people. Our guide was an energetic businessman named Nassif from Dubai who volunteers at the Sheikh Mohammed Centre in his free time like Debbie. He was also very informative and entertaining, but lead the tour in a different way than Debbie. After the tour he told me that everyone of them has her or his very own way of leading this tour. For me, both of my tours were excellent and every one of them was as good as the other. I would highly recommend this tour to anyone who is going to visit Dubai and who is interested in getting an insight into the Emirati culture and the religion. The tour takes place six days a week from Saturday to Thursday at 10 A.M. (Fridays closed) and lasts 75 minutes. 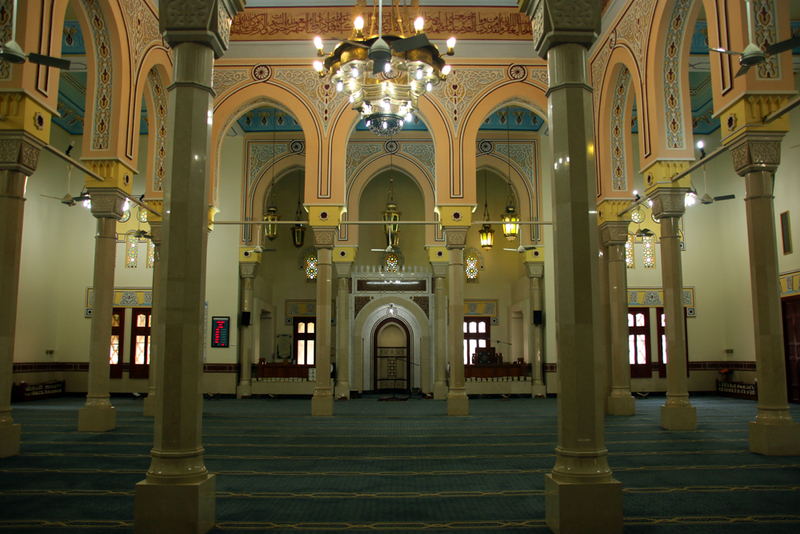 Visitors should be at the Mosque by 9.45 A.M. The entrance fee costs 10 United Arab Emirates dirham (about $2,75; 2,40 Euros). You should dress modestly and cover shoulders and knees. Females should also bring a headscarf. If necessary traditional attire can be borrowed from the Mosque. It is certainly a great adventure although I am not a big fan of guided tours! You look so beautiful dressed up like one of the locals :)!! Awww, thank you so much for your kind words, Agness. I can totally understand you for not being a big fan of guided tours as I am picky, too, when it comes to that, but this one is really good and not the typical guided tour. Plus as far as I know it is the only possibility to see the Mosque at all. Thank you so much, Julie. I can highly suggest to visit Dubai and the other Emirates for especially for the fantastic mix of tradition and modernity. Morocco is one of the countries I intend to explore within the next few years. I will definitely check out your Blog.